I come to you with a giveaway today! Hooray! I have partnered with OshKosh B’gosh where they are sponsoring today’s giveaway. One winner will get a shopping spree of a $50 gift card to OshKosh B’gosh. For details of this giveaway on SMM, see paragraph in bold below. I love OshKosh clothes for my girls. They are durable and the colors do not fade like other children’s clothes I have purchased in the past. Not to mention super cute styles too. 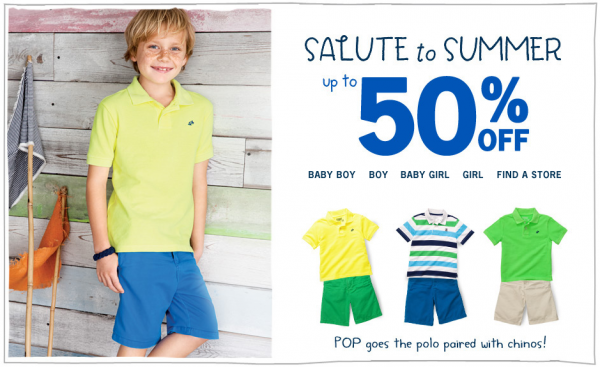 They are also having their summer sale right now with 50 percent off. But even better, OshKosh B’gosh is having their own contest where they are giving away a $5,000 gift card and other prizes to several winners. The contest ends next Tuesday so you have to hurry and enter. To enter, all you have to do is record with your camera, camcorder or smartphone a short video (30 seconds or less) of your child saying “OshKosh B’gosh” six times. Then upload it directly here. Say it with a silly dance, say it slow or fast. You can get creative with it. NO PURCHASE NECESSARY. 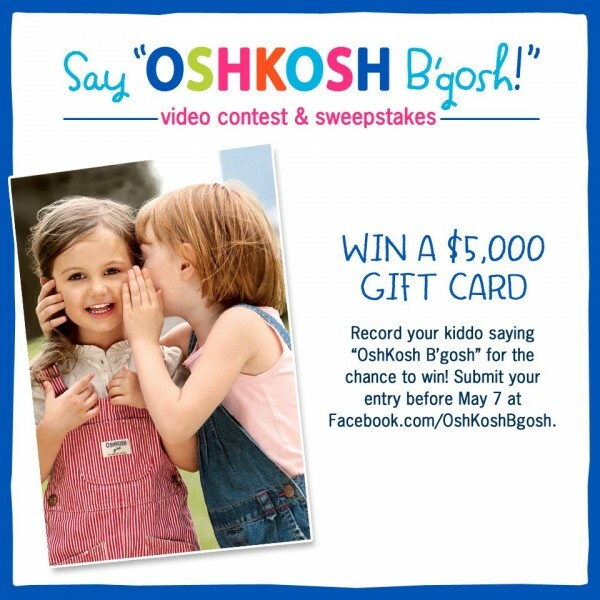 The Say “Oshkosh B’Gosh!” Video Contest and Sweepstakesends 5/7/13. 18+, 50 U.S./D.C./P.R. only. Go to their Facebook page for official Rules and complete details. Anyway, I’m giving away a $50 gift card on Simply Modern Mom to one of you! All you have to do is comment below with your favorite OshKosh B’gosh style or outfit. What would you buy if you won the gift card? If you want to get a second entry for the giveaway, share this giveaway via any of the social media or email to your friends. For a third entry, follow SMM on Facebook, Twitter, Pinterest and/or Instagram. This giveaway ends on Sunday, May 5 at midnight. I will pick a winner next week. Good luck! Disclaimer: OshKosh B’gosh partnered with bloggers such as me to help promote the Say “OshKosh B’gosh” Video Contest and Sweepstakes. As part of the program, I received product or gift cards. OshKosh B’gosh believes that consumers and bloggers are free to form their own opinions and share them in their own words, and therefore did not tell me what to purchase or what to say about the products I used. OshKosh B’gosh policies align with WOMMA Ethics Code, FTC guidelines and social media engagement recommendations. The winner of any prize in this program will be chosen in accordance with the program’s Official Rules and gift card fulfillment will be handled by a third party. I love the so girly & twirly collection set– all the outfits are adorable!!!! I would definitely want some overalls for my baby boy! Nothing cuter than a baby in overalls! We had this gorgeous red and white embroidered Oshkosh dress that we’ve passed through all 4 girls on John’s side of the family for 4th of July. I love their cute tshirts and shorts for summer! I would stock up on their colorful summer styles for my daughter with the gift card. I have bought Osh Kosh outfits in the past and have loved them! I love their overalls on little kids, so cute! I would buy some cute dresses with a gift card! I love your blog and love winning stuff. It’s a perfect match! We love Osh Kosh B’Gosh clothes! My girls love the sundresses and maxi dresses and the tunics with leggings! I would use the gift card to buy summer dresses for the girls and a matching set to have professional pics done. The quality of clothes is fantastic and fade resistant! I just sold some of the clothes at a recent consignment sale that both of my girls have worn and they were in excellent condition! I would buy my son a pair of plaid shorts with a matching polo and my daughter the floating floral popplin skirt. Yankee Doodle Dude outfit is my favorite. Thanks for the chance at winning this for my son. I don’t know much about Osh Koshs lines, but I would definitely get some dresses for my newborn girlie and some shorts or skirts for my older princess. Love the summery polos and chinos for a baby boy. Too cute. I would buy summer clothes for the kiddos. skirt or dress for the girls and shorts/shirt for the boy. So fun!! I love dresses for my girls if course! Any thing that twirls is a hit around here! Also, I have the cutest niece and nephew and would probably get some cute overalls! I follow you on fb and Instagram! I would LOVE to win this! I have recently rediscovered my love for OshKosh. I just bought my kids all matching poplin flower skirt/dresses, and my 3 year old got the adorable yellow/white polka dot shorts with an aloha shirt, and the cutest floral tshirt with play skirt (shorts underneath!). I didn’t see it on the site, but it is my absolute favorite. Love the skirts in so girly and twirly. I would buy my grandsons some bib type overalls – classic look and so cute.